Most brides dread the thought of inclement weather on their wedding day. Rain stinks, to be sure. Snow is usually worse and I’ve seen many weddings affected by New York blizzards over the years. But at this winter theme wedding the bride and groom arranged for the snow. At their amazing wedding venue, The deSeversky Mansion and Conference Center, they had their entertainment company shower them in snow as they danced their first dance together as husband and wife. The key to making this shot dramatic is to illuminate the snow, and the couple, from behind. I photograph every wedding assignment accompanied by a skilled photographic assistant, and for this shot my assistant assumed a position behind the bride and groom to illuminate the bride’s veil and the man made snow that was cascading around them during their dance. As much as I hate the thought of bad weather on your wedding day I have experienced every conceivable weather event and have delivered wonderful wedding pictures regardless. 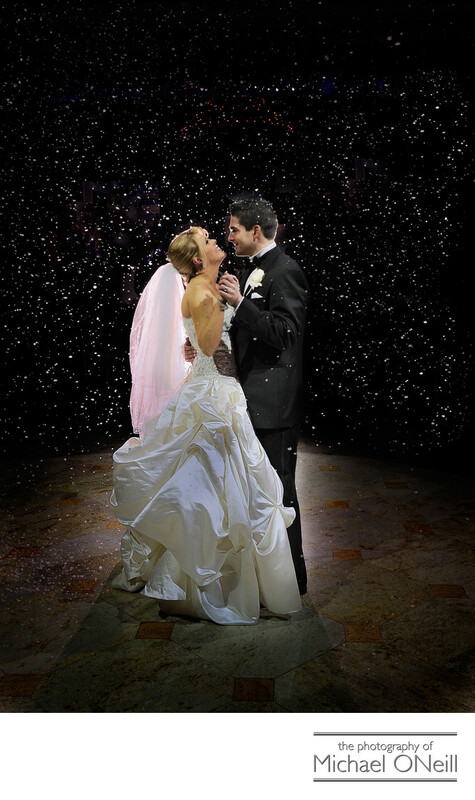 I do have to admit, however, that this was the first time a bride and groom were happy that it was snowing.